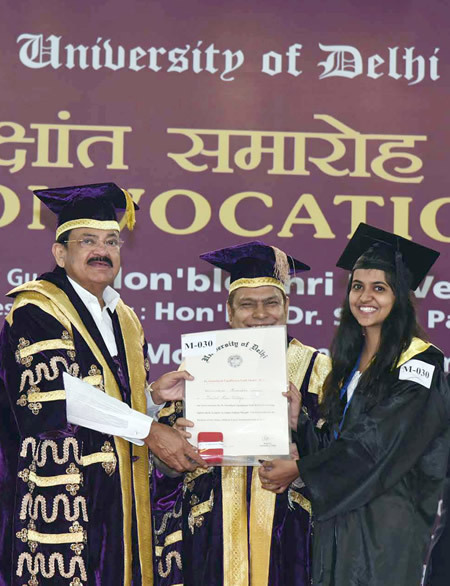 Photo: The Vice President of India, M. Venkaiah Naidu, presenting the Degrees and Medals to the Students at the 95th Annual Convocation of the University of Delhi, in Delhi on November 19, 2018. New Delhi, November 19, 2018 — “You have been lucky enough to gain education from this great university. However, on this day, spare a thought to those young people who did not get such an opportunity in spite of deserving it. It is up to us to take the benefits of education and the opportunities it opens up to the last mile, to the last person,” the Vice President of India, M. Venkaiah Naidu, told the graduating students of the University of Delhi. He was addressing the 95th Annual Convocation of the University of Delhi, here today. The Vice President congratulated the University and said that that the vision and mission of the University truly reflected its long-term commitment to nation-building and steadfast adherence to universal human values. He added that the motto of the University, ‘Nishtha Dhriti Satyam,’ Dedication, Steadfastness, and Truth justly reflected its ideals. Congratulating all the graduating students and prize winners, especially the young women, the Vice President appreciated the University’s focus on women’s education. The Minister of State for Human Resource Development, Satyapal Singh, the Vice Chancellor of the University, Prof. Yogesh Tyagi, students, faculty and staff of Delhi University, and parents were present at the ceremony.